Over the last month Bologna has been shaken by a wave of housing occupations. These occupations should be seen in the context of the nationwide weeks of action which culminated in 19 October’s national demonstration in Rome. The occupiers justify their action as being a response to what they describe as a housing emergency. ASIA-USB (a base union at the forefront of the housing rights movement) quotes the following figures about Bologna from 2012: roughly 1,000 families were served with an eviction order and almost 10,000 applied for social housing; by contrast, 7,000 privately-owned apartments and 225 publicly-owned units of accommodation stood vacant. The lack of affordable housing in Bologna has been a key issue for almost two decades. Though housing activists had been raising the situation for some time, the issue only made it into local mainstream public debate in 2009, after Nomisma (a Bologna-based economic consultancy with nationwide influence) published a detailed report on Italian housing. The report showed that from 1991 to 2009 there was an almost 100% increase in Bologna house prices and 75% increase in rents, set against an average increase in income of only 18%. Local housing policies have worsened rather than improved the situation. Valerio Monteventi, an activist and former Bologna councillor, pointed out in a detailed report published in 2010, that local authorities were unable to address the needs of the most vulnerable city dwellers – migrants, students and low income households. Local housing policies failed to promote the building of student dormitories and cheap collective housing and also failed to make existing publicly-owned social housing property fully habitable. There are occupations in a number of neighbourhoods in Bologna, involving a variety of grassroots movements. In the city centre ASIA-USB, together with a dozen families previously evicted from their homes, has occupied a large abandoned housing project. Also in the centre, Labas (a student collective currently based in an occupied former barracks) has launched a project called ‘crowd housing’ – a joint refurbishment of part of the barracks to make it habitable, particularly for students. Another action, also mainly addressing the housing needs of Bologna’s massive student population, is the ‘Studentato Occupato Taksim’ (Occupied Taksim Student Residence). The Studentato has been set up by the CUA, a militant student collective, in a former convent boarding school on the outskirts of Bologna which has lain empty for more than three years. A second action on the outskirts is the occupation of a private residential building in the Bolognina neighbourhood. Bolognina is a traditional working class neighbourhood currently at the centre of massive urban regeneration projects which may bring about substantial gentrification. The occupiers’ public statements have explicitly framed their actions as a form of struggle against this wider process. Although tolerating most of the new occupations, the city council evicted the Bolognina occupation. This was carried out without any consideration of alternative housing for the occupiers. A few days later the evicted occupiers began a second action in yet another empty privately-owned building in Bolognina. 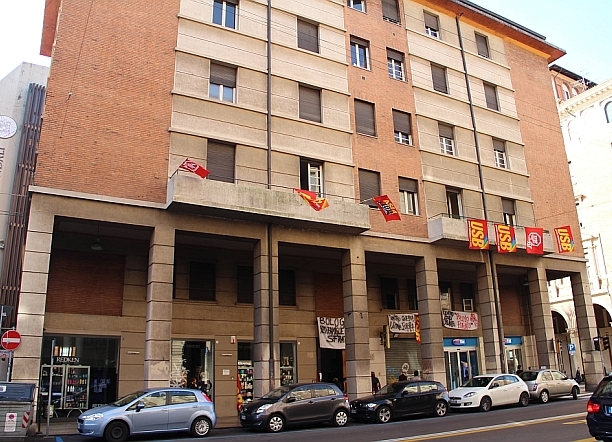 Occupiers here were evicted and two of the activists involved – who had drawn out the eviction process by climbing on the roof of the building – were served with an expulsion order from Bologna. Despite this, the activists involved in the action expressed their satisfaction in their last public statement. The occupations, they wrote, are a ‘clear message to Bologna’s authorities’, they ‘will continue and the evictions will be more and more troublesome. We’ll see who gets tired of it first’.